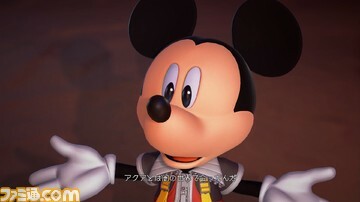 News ► New KINGDOM HEARTS 0.2 Screenshots! Two new screenshots for KINGDOM HEARTS 0.2 Birth by Sleep -A fragmentary passage- have been released through Famitsu. 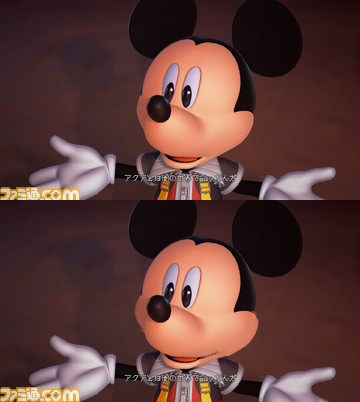 One depicts Mickey as he informs Riku and Kairi of his encounter with Aqua in the Realm of Darkness, and the other of Aqua in the middle of a forest. These look really good. I'm glad to see the improvements to Mickey's look specifically. But I wonder what exactly Mickey is telling Riku and Kairi... Hmmmmm... I guess I'll have to wait another 70 days to find out. "Why yes Riku, it was this big." Man Mickey has had a LOT of improvement, if they toned down the shine on his face a bit more he be perfect. The fact we can see up Aqua's sleeve is incredible weird feeling, like it almost lets you picture her without them which just feels wrong. No, Mickey does not look how he usually does. Even in normal Disney 3D models, he has those cut fluffy thick cheeks. He just looks strange imo. Agreed. Mickey kinda does still look a bit off, though chu can tell they've put in more effort to make him look better. Ish hard to say exactly why. 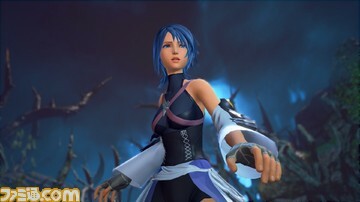 @Hirokey123: Honestly, I think ish better this way, makes Aqua look more exposed to the darkness of the realm of darkness this way, which suits the plot perfectly in my opinion. Of course this is a major improvement and all, but I just feel like they're trying too hard to make Mickey look more like a real mouse. Okay, if Aqua is going back to Enchanted Dominion, then there is no longer a doubt in my mind - 0.2 is gonna probably end up connecting directly to chi/Unchained chi. Hmm, yeah, I think thash more of what I was thinking too. Crappy Paint edit powers go! Eh, I also feel like they should make Aqua's... sleeve-thingy a bit thicker, so it doesn't seem as thin. Like... it just looks strange. Edit: Now THAT'S more I like it, Fudge! It would be perfect, cosidering Back Cover is in the collection. It'll be nice to see how it ties in all together. Yeah, I can't lie, even with any improvements, they still haven't "Mastered" (hohoho) Mickey's iconic look. It's a very simple design, but easy to get askew. I don't mind the original characters looking a tad different, but the Disney designs should remain faithful. Considering how well they have made him look in-game and with CGI, it's a wonder why they can't quite successfully capture his likeness here. I don't see anything wrong with Aqua's sleeve. Maybe it's just the angle. Okay I think I know what the problem with Mickey is. They're trying to have him express more emotions without having him look like there's a smile just stuck on his face despite him looking sad or something. Unfortunately, Mickey is pretty tricky to animate without dimples in the 3D realm, unless you're the Steamboat Willie style Mickey or Epic Mickey. Also, a lot of people are used to Mickey having the dimples that are a part of his trademark smile. Take those out, and yeah people are bound to say that something's off. Whoa, Mickey sure has improved from the last time we saw him. He is looking pretty good now. Yeah, Mickey looks a bit off to me too. The "forest" looks more like thorns to me, so I guess Aqua is in Enchanted Dominion. Yeah, he kind of looks like an egg. A shiny egg.